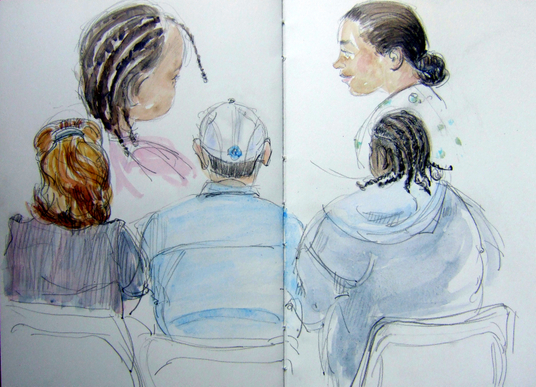 At the DMV yesterday, waiting while my daughter got her latest replacement driver's license. You'd think that the Department of Motor Vehicles was our favorite charity, if the number of times we've contributed to it over the past five years were an indication of our devotion. Great sketch! This made me laugh....because my son has had 2 replacements in the 3 years he's had his license. I guess he he is going on a "new license each year" program! Thanks, thanks and more thanks to my wonderful commenters! France, usually I paint on site, but I'm now trying to paint the black and white sketches when I get back to the studio, too. The colors will never be as nuanced (never say never! ), but I like adding that dimension to the sketches. I absolutely LOVE drawing my fellow creatures ;D. We're all such odd ones, with so many twisty lines and funny shapes. People are such great subjects, even from the back I can imagine the different personalities! Wow, I've been so neglectful of you and you've gone and changed the blog and the pictures are bigger and brighter and I really like the new look. And the paintings of course. I always like the paintings. And markers are cheap compared to $36 brushes ($2.50 per). And in Florida, your drivers license is perpetual. They send you renewals whether you're alive or not. You should see who drives here. Ack! You must have had a long wait! !